Winnie the Pooh Friendship Quotes provide a touching look on what it means to have a friend and be a friend. Whenever the subject of friendship comes up, both kids and adults will remember the character of Winnie the Pooh. The famous character may have been introduced in the 1920s, he is still relevant and cherished worldwide. As Pooh fans know, the cornerstone of Winnie the Pooh’s story is his friendship with Piglet, Christopher Robin, and others who live in his forest. A.A. Milne’s Winnie the Pooh introduced some of the most memorable words and moments that friends can cherish forever. Tens of millions of people grew watching Winnie the Pooh and his adventures with his friends and learned many lessons about friendship that they could carry along in their heart, forever. 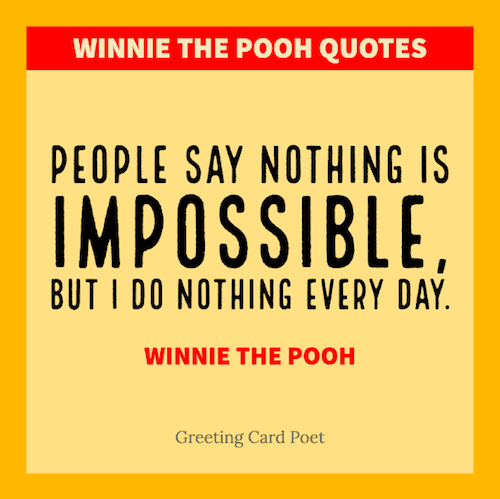 Here are some lovely Winnie the Pooh friendship quotes that you can share with your friends and loved ones or cherish in your heart. These quotes can also remind many of their childhood inspiration and lessons they may have forgotten! How lucky am I to have something that makes sayings goodbye so hard! I knew when I met you an adventure was going to happen! Here together, friends forever. Some things were just meant to be, and that’s you and me. Piglet: We’ll be friends forever won’t we, Pooh? We didn’t realize we were making memories. We just knew we were having fun. 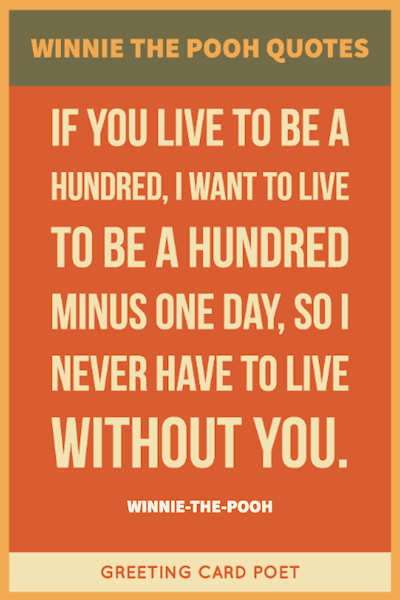 If you live to be 100, I hope I live to be 100 minus 1 day. A friend is someone who helps you up when you’re down, and if they can’t, they lay down beside you and listen. I think we dream so we don’t have to be apart for so long. If we’re in each other’s dreams, we can be together all the time. If there ever comes a day where we can’t be together, keep me in your heart. It’s not what we have, but who we have. It seemed they had always been, and would always be, friends. Time could change much, but not that. it’s who you travel with. Nowhere is a wonderful place, especially when you’re beside your best friend. It is more fun to talk with someone who doesn’t use long, difficult words but rather short, easy words like, What about lunch? Once in awhile someone amazing comes along… and here I am. This…whatever it was…has now been joined by another…whatever-it-is… and they are now proceeding in company. Would you mind coming with me, Piglet, in case they turn out to be Hostile Animals? Tip: Use some select Winnie the Pooh Friendship Quotes as captions for photos of you and your favorite friends on their birthdays. I’ve found somebody just like me. I thought I was the only one of them. As the two friends wandered through the snow on their way home, Piglet grinned to himself, thinking how lucky he was to have a best friend like pooh. You don’t spell it, you feel it. It’s so much more friendly with two. Christopher Robin: Pooh, promise you won’t forget about me, ever. Not even when I’m a hundred. This is a hug from me to you, to let you know I am thinking of you, and although I have nothing to say, you know I have thought of you today. I love the kind of hugs where you can physically feel the sadness leaving your body. Even if we’re apart, I’ll always be with you. Always remember you are braver than you believe stronger than you seem and smarter than you think. Pooh: What do you say, Piglet? Piglet: I say, I wonder what’s going to happen exciting today? Pooh: It’s the same thing. Piglet: Nothing, I just wanted to be sure of you.